I like the idea of “Follow Friday”, but I feel a little silly at the thought of trying to advise more experienced family researchers. For all the hours I’ve devoted to finding out more about my own family, I’ve really only been doing this since 2011. Which is nothing compared to the decades I know that many others have put in! So this list is geared toward genealogy “newbies.” I do think I’ve come a long way in my first couple years of research, and I couldn’t have done so without the following sources. (Genealogy veterans probably know about all of these — but if one of you learns something new, then all the better!). Bear in mind that this list only includes resources that I’ve personally utilized; I haven’t yet tried any of the genetic testing kits, for example (such as 23andMe), so they aren’t included on the list. A whole library devoted to genealogy! I went here in September 2012. 10.) Libraries: Life in the “digital age” means it’s easier than ever before (or so I’ve heard!) to delve into our family histories. Sure enough, through my web searching, I’ve come across photos, newspaper articles, and other gems that I never would’ve guessed I’d find floating around online. Still, for all the treasures just waiting to be discovered on the Internet, there’s an ever greater wealth of information that hasn’t been archived (and might never be). That’s where good, old-fashioned libraries come in! Some people are lucky enough to live near libraries devoted entirely to genealogy. Salt Lake City’s Family History Library is one obvious example; but it certainly isn’t the only one. Myself, I’m overdue to visit the family history library in Tacoma, WA (which, at 30 or so minutes away, is the closest one I’m aware of to where I live). 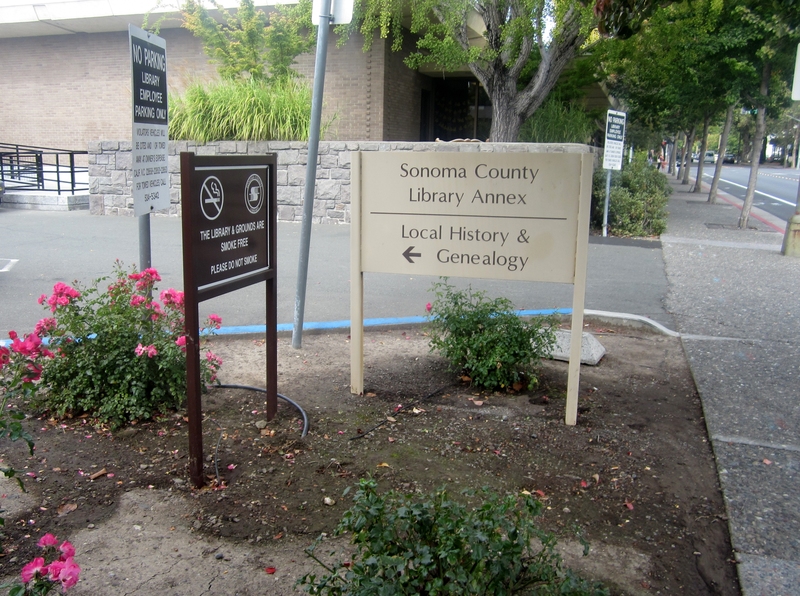 However, on a visit to Santa Rosa, CA last summer, I did get to visit the Sonoma County History & Genealogy Annex (pictured above). The building was small, yet packed with books divided by location (not limited to California) and year; directories; and (my favorite) archived newspapers dating back over 50 years. I stayed there for over 2 hours — and afterward wished I’d had more time to spend! Meanwhile, if you don’t live near a genealogy library, I’d still recommend checking out your regular library. You never know what books might be sitting on its shelves. The library here in Olympia also has a couple of stations set up for people who are interested in family research (I think this is a common trait for libraries) where you can access programs such as Ancestry Dot Com for free! Pros: Free; access to information you might not be able to find online; librarians available to help you out. Cons: Limited hours; libraries aren’t always quiet; some branches might not offer as much as others. In honor of my 4th great grandmother, Isabella Whipple, the Whipple Coat of Arms (courtesy of Whipple Website). 9.) Family-specific forums and websites: If you’re so overwhelmed by the thought of research that you don’t even know where to begin, why not start with one branch of your family and focus on that name for awhile? It doesn’t have to be your given name (although, of course, it’s fine if you do choose to start there!). Many families seem to have forums that are at least semi-active over at GenForum; the Tillinghast Forum there is where I first encountered my distant cousin, Todd Lawrence, who maintains his own database of Tillinghasts (and thus, was able to tell me my line from ancestor Pardon all the way down; he also sent me a pdf file FILLED with names of descendants of my 2nd great grandparents. From that list, I’ve connected with numerous cousins-once-removed, second cousins, and third cousins that I hadn’t known existed before; I’ve even met some of them in person!). Pros: Free; you can connect with fellow researchers and family members; many family websites are kept up-to-date and are quite thorough (with cited resources, etc.). Cons: A lot of families don’t have websites or GenWebs; some websites are out of date; lack of activity on many forums. 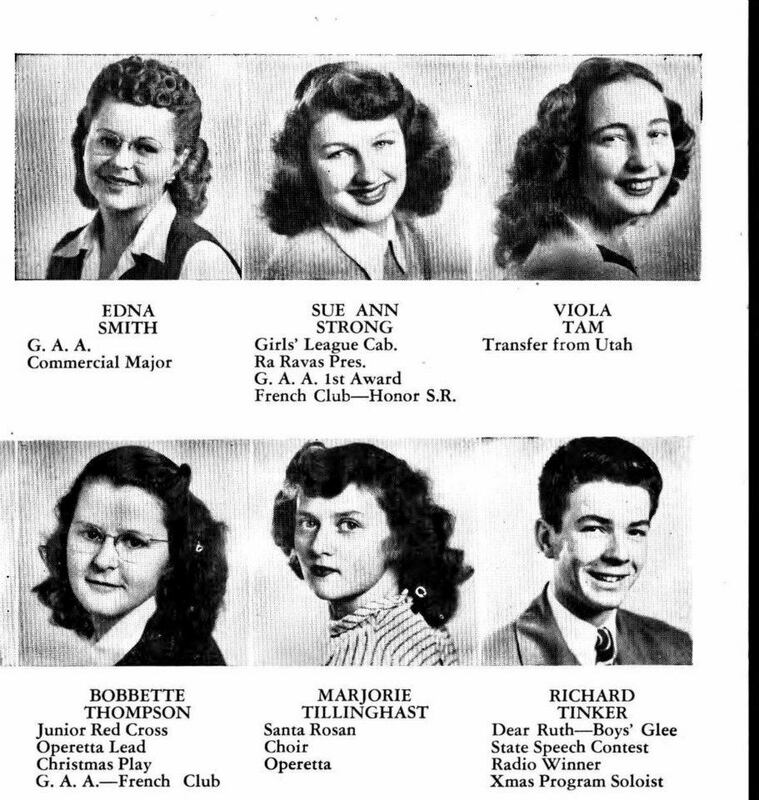 Six graduating seniors of the Santa Rosa High School Class of 1947 (including my cousin-once-removed, Marjorie, bottom center). 8.) Yearbooks: Unfortunately, I don’t own any old yearbooks of family members (if you do, you’re lucky! ); however, there are places online to view archived versions of entire yearbooks from all over the country. I found the above photo — and many others — at Classmates Dot Com. I think you have to register to view the yearbooks, but I used an account from years ago and didn’t have any trouble looking at them (and didn’t have to pay anything, either). Even a family member who had a few of these yearbooks back in the day was surprised to see some photos resurface after I shared them! Pros: Free (if you own a hard copy of a yearbook or view it at Classmates Dot Com); you could find a clue or two inside, and even if you don’t, they’re a great place to see photos that you might not find elsewhere (in the case of my cousin, Marjorie Tillinghast, pictured above — who died in 1960 — the yearbook photos I found online are the only ones I’ve seen of her). I even found a few of my parents’ old yearbooks at Classmates! Cons: Some yearbooks might be hard to find or not very useful for research; registering at Classmates Dot Com could be too much of a bother. 7.) Google: Yes, Google! The search engine alone could lead you to family trees, family websites or GenWebs, obituaries… you name it. Try searching for a family member’s name in different ways: type it in quotes, vary the spelling, search for it along with another family member’s name or with a relevant phase (i.e. a location where that family member lived). Who knows what you might find? I once came across an old Yahoo! mailing list archive dedicated to descendants of my great grandparents — which hadn’t had any real posts in years, yet included anecdotes about them… and a transcribed letter from my great grandfather (see this post for more on that!). If you’re trying to track down family members who are still living (and don’t feel too stalker-ish), a Google search could also lead to something like a MyLife or WhitePages Dot Com page. I don’t know how accurate the information on these pages tends to be (I haven’t actually contacted anybody using MyLife or WhitePages) but you might be able to verify an age or connection with another family member; I’ve had some luck with this (verified after contacting the family member in question later on, or asking somebody else knowledgable). Then there’s Google Books, which is even more fun than regular old Google! I’ve found a lot of interesting stuff on here just by typing in my ancestors’ names; some searches will yield a page or two, others pull up entire (public domain) books. If you don’t want to read the books straight from Google, you’ll at least have the information to try to locate them elsewhere. Sadly, I don’t believe Google maintains a News Archive anymore, but that was just as fun as Google Books; the news archive is where I first found the shocking-yet-fascinating news story about my 3rd great grandfather and the 75 criminal charges filed against him (when he was about 75 years old!). Pros: Free; endless possibilities; Google Books. Cons: Questionable accuracy on some search results; not every search is fruitful; no more Google News Archives! 6.) Social networking: While Genealogy Wise caters specifically to genealogy (there aren’t very many participants there, but some forums remain active), really any social networking website can come in handy for your research. I’ve used good ol’ Facebook for tracking down long-lost cousins (mostly from that list Todd Lawrence sent me). Of the people I’ve sent friend requests to, about 2/3rds accepted; of those, at least 50% initiated communication and/or responded to questions I had. In other words, I can’t speak for others’ experiences; but none of my family members seemed to mind my contacting them, and many of them seemed happy that I did so. (So be courteous, of course — but don’t be shy!) I’m now in touch with several of these cousins on a fairly regular basis. You can also join or create family-specific groups on Facebook (some of these groups are public, others are private; if you create or moderate a group, you can decide which privacy level you prefer). The activity level of these groups varies — but in general, they’re another great way to meet cousins, share photos and information, or plan get-togethers or reunions. The possibilities are infinite! Pros: Free; convenient (if you’re already on Facebook or whatever social networking site you want to use), direct contact with family members. Cons: Privacy isn’t guaranteed; social networking sites aren’t for everyone, you might meet a family member who you… don’t like (or simply don’t wish to hear from anymore; or it could go the other way, and you might meet a cousin who doesn’t like you!). 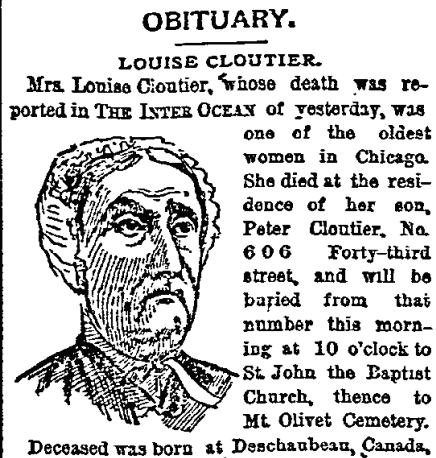 Obituary courtesy of GenealogyBank; as far as I know, I’m not related to Mrs. Louise Cloutier. 5.) Obituaries: Often genealogical treasure troves, obituaries can be found via many of the other sources in this list. I’ve used them to verify connections; I’ve discovered some connections that I wouldn’t have even known about if I didn’t read certain obituaries. Of course, they’re also nice ways to learn more about family members — and to uncover stories that, again, you just won’t find anywhere else. For example, I read in one 4th great grandfather’s obituary that he was trampled by a horse after suffering a heart attack in his barn (yikes!). Pros: You can verify names, dates, and family connections, learn names of survivors, and read interesting stories. Free (depending on which site/source you use to access the obituaries). Cons: Some obituaries aren’t as thorough as others; names or other relevant bits of info are occasionally inaccurate or left out. 4.) 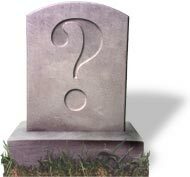 Find A Grave: And here’s an excellent place to find obituaries new and old. This utterly addicting website vows to eventually list the burial location of every person who ever existed. I’m not sure how close they are to fulfilling that goal; however, I do know that the database grows every day. I’ve already found an impressive number of my family members! Some pages are pretty sparse; but most of them will at least list a burial location. Many pages include photos of gravestones (which are awesome for research — gravestones don’t lie!). Some link to family members, and many of the pages include obituaries and family photos. Pros: FREE! ; addicting; interactive; a great source for photos, stories, and connecting with others. Cons: The “transfer” process can be kind of annoying, especially for pages that were created by Find A Grave and can’t be transferred (i.e. my grandfather’s); not everybody is listed; dates and names are sometimes inaccurate (but in general, I’ve found this to be a reliable website). 3.) Non-Ancestry.com genealogy sites: Everybody has heard of Ancestry Dot Com, but there are similar sites out there that are certainly worth a look. FamilySearch Dot Org is operated by The Church of Jesus Christ of Latter-Day Saints. It’s free! From my experience, FamilySearch isn’t as thorough as Ancestry Dot Com — and some of the family trees and other search results can be hard to navigate — but I’ve come across a couple of records there that I couldn’t find anywhere else (i.e. the death record of a cousin who died as a baby; before I found this record, I was starting to wonder if he’d even really existed). So I appreciate the website for that. Archives Dot Com is not free — and is actually owned by Ancestry, if I’m not mistaken. Still, it’s a little more affordable than Ancestry, and some might think it’s less overwhelming. I’m not really sure if you can find information on this site that can’t be found elsewhere. GenealogyBank isn’t free, either, but it might be up your alley if you’re looking for obituaries or other news articles. I’m not crazy about their signup process (to me, ‘get unlimited 30-day access’ indicates some sort of trial period, which is… not really the case). I’ve tried their services twice; I didn’t have trouble canceling the first time, but the second time, I had to call and “remind” them that I’d canceled my membership after I was unexpectedly billed (I had no further problems after that). On the plus side, their database seems pretty large; I found at least three obituaries that I haven’t seen at any other site! RootsWeb is another Ancestry Dot Com-owned company. I’ve questioned the accuracy of much of the information I found there. But it’s a good starting point — and it’s FREE! Pros & Cons: Nothing I haven’t already mentioned… see above. 2.) Ancestry.com: Sure, it’s expensive. But, to me, it really is the most comprehensive source of its kind — and I keep coming back to it! Not only are you able to create your own family tree… the scope of information here is enormous. There are censuses; birth, death, marriage and military records; yearbook photos; news articles and obituaries; personal family stories and pictures; etc., etc., etc. I also use Ancestry’s software program, Family Tree Maker. I wouldn’t say that it’s necessary, but it’s nice if you want an additional place to document your tree (you can “sync” the software with your online tree, so you only need to enter names and other information one time and it will save to both places). By the way, don’t focus too much on other users’ public trees; sometimes, the information is accurate, but other times people will list a mother whose birth date falls after her supposed child’s — or other “facts” that don’t make sense. Still, these trees can be good starting places. And you can verify what you find with the censuses and other, more trustworthy documents that are available right there at the very same website! Pros: Huge library of documents and information; addicting; informative. Cons: Not exactly cheap; occasionally overwhelming; often inaccurate information on public family trees. 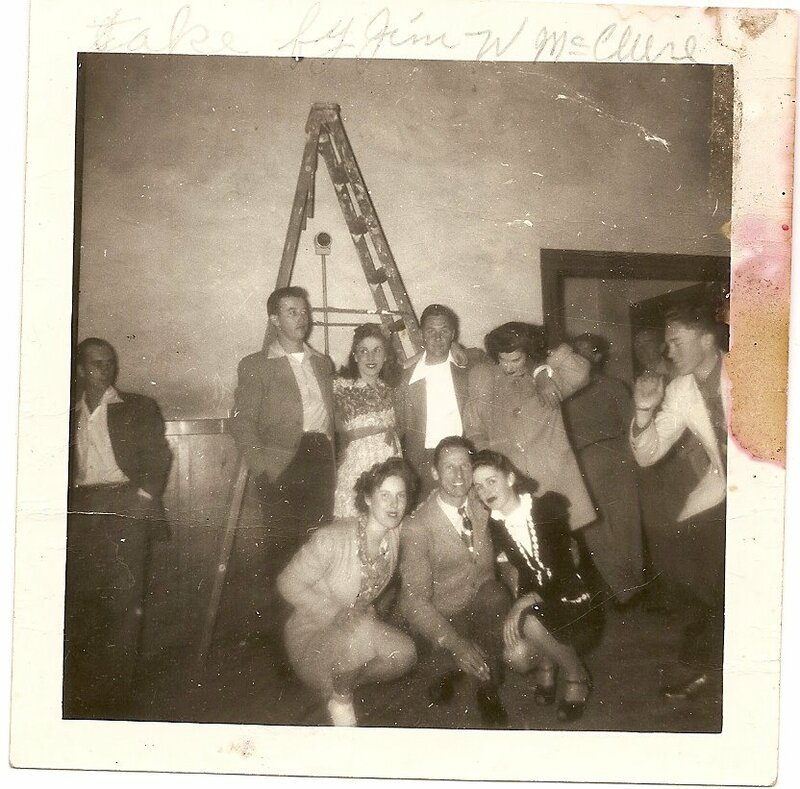 My cousin-once-removed, Virginia, and my paternal grandparents, George and Clara aka Susie (in front); my great aunt, Frances, is behind them with some friends or family members I don’t know. Photo courtesy of my cousin-once-removed, Marlene (Virginia’s sister). And if you don’t have luck the first time, try again! My mother didn’t think she knew anything about her grandmother’s history. But she was able to recall just a few key names, and from there (after a few Ancestry Dot Com searches) I was able to verify what she told me, fill in several spots on my family tree, and make some new connections! Pros: Stories more personal than you’ll find anywhere else… heck, what isn’t a “pro” about learning family history from your family? Cons: I suppose some family members might have their facts wrong (it’s still fun to talk to them, find out what they know, and get their perspective). Whew! There you go. I hope this helps at least one person out there. Feel free to share your own suggestions in the comments (or shoot me an email! ).